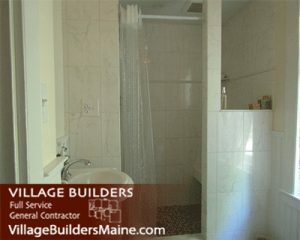 This kitchen remodel was unique in that it changed the family’s entire first floor. Initially, the space was outdated, and simply not working for this wonderful family of six. Improved use of space and modernization were the goals, and I would say they were reached! This small family from White Rock started out with a one bedroom ranch with an attached garage. 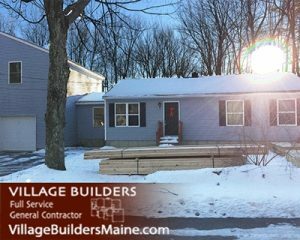 Over the last four months we’ve been working with them to transform their home into a beautiful three bedroom cape, complete with a total first floor remodel. 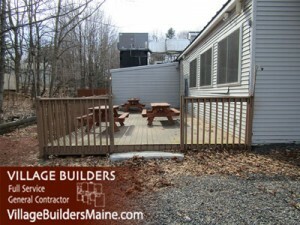 This major renovation updated their entire space to include a second story, a new kitchen, two new bathrooms as well as a new living room and bedrooms. 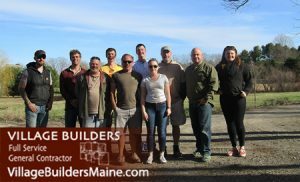 This project initially began in January which made the building process a little challenging since unpredictable weather could seriously ruin the entire project and the family’s home. One of our lead carpenters, George set out to avoid any possible problems or mishaps that we might run into during the construction process. 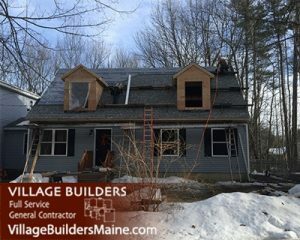 George managed to add this second story addition without ever leaving the family’s home open to mother nature; the original roof never come off during the construction of the second story. 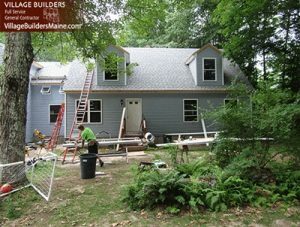 Although our crew has plenty of experience with second story additions, this method was a first for Village Builders. Keeping in mind all that our veterans have done for our country made this job extra memorable for Village Builders. On the left, we can see how this project started. 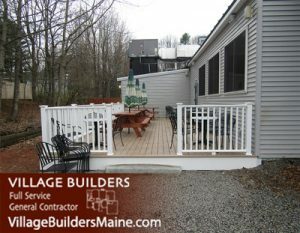 A large deck off the back of the couples house made a great starting point for a sun room. 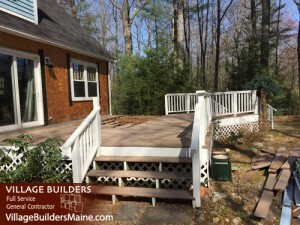 The size of the existing deck even made the beginning stages a little easier on the carpenters. 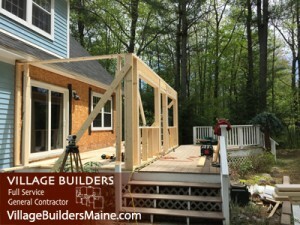 To the right, we can see the starting stages of framing. 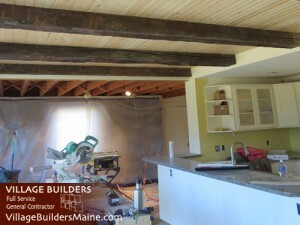 The entire room and openings are framed, and we can get an idea of what the room it’s self is going to look like. Later on, the walls and roof get built.